Just a caveat before we start: If you started sleep coaching/training at 4-months and it worked well without a lot of stress, this article isn’t for you. For some families, with predictable, mellow babies or family needs that require big chunks of sleep right now, sleep coaching at 4-months may be a good option. However, some parents may feel pressured by sleep advice books who say to start sleep training now  (some say even earlier ) or experts who warn that if you don’t do it now, it will be much harder — maybe even impossible — later. Other parents may have tried to follow the advice from books and found that there was a lot more crying and not much progress on lengthening sleep. There are reasons why sleep training can be difficult or, in some cases, unwise at this age. Further, the push to start sleep training early is actually not borne out by existing research on sleep. While it’s true that if you do nothing at all, research shows that sleep problems will persist , there is no research that clearly demonstrates the need to start this early or whether it’s problematic to wait until 6-months. Why is sleep so difficult at 4-months? Brain Growth & Development. The biggest culprit is The Four-Month Regression — a massive jump in both physical growth and brain development that can result in feeding disruptions or bursts, more fussy behavior, and more disrupted sleep. In fact, sleep will be a little more disrupted around all of the big developmental milestones that happen into the second year. For many babies, sleep isn’t always something that stays fixed. It can be full of ups and downs as little ones mature across those first two years. Feeding needs. Feeding at this age can also still be quite unpredictable and varies a lot between individual babies. Frequent feeding at this age can be normal, or a sign of an underlying physiological issue like silent reflux or an organic feeding difficulty . Further, babies’ tummies at this age are small. There are limits to how long they can go without a feed. There are limits for moms, too. In fact, some research showed that feed spacing was related to a higher rate of lactation problems and stopping breastfeeding . At this age, milk is a potent sleep-inducer. Attempting to lengthen the feeding interval past what the baby can tolerate can result in a lot more crying. Ruling out feeding or reflux issues with a healthcare provider or lactation consultant can give parents good guidelines for how to manage bedtime and nighttime feeds and awakenings. Silent Reflux or Milk Allergy. Parents we see often say, “My baby doesn’t have reflux because they’re not spitting up.” If your baby cries a lot, doesn’t tolerate lying on their back, arches during feeding, or doesn’t seem to sleep well anywhere, you may want to investigate whether your baby has reflux that doesn’t result in spitting up. A baby in pain will not be able to sleep well and may need a lot of parental help with soothing if they’re not feeling well. Basic self-soothing abilities are still forming. Parents are frequently told that if you leave the baby to cry, they will learn to stop signaling for help and will instead, self-soothe and return to sleep. “Self-soothing” is not a skill that infants are simply born with. Their ability to calm themselves down when they are distressed develops gradually over the first two or three years. Between 4- and 6-months, the brain undergoes a massive burst of synapse growth as important skills and abilities are established . Self-soothing is not merely a matter of stopping crying and going to sleep, but involves a complex system of skills including reorienting, distraction, soothing, and finally, sleep, and requires help from specific parts of the brain that may not be “online” at this stage. Four-month-olds only have a few tools in their “self-soothing” toolbox. These very basic abilities help them tolerate only very small amounts of distress before they need help calming down . At this stage, they may be able to turn their head to view their hands or turn away from what’s bothering them, but they don’t have the skills — or the brain structures — necessary to calm down from more intense distress. This may be why you find that trying to do sleep training at 4-months results in more crying and less sleep training success. The skills that babies need to manage sleep and crying are more firmly in place after the 6-month mark and they will continue to expand across the first few years. There is no research that clearly demonstrates the need to start sleep training early, or whether it’s problematic to wait until 6-months. What do we know about sleep training before 6 months? Not much. There is virtually no research on sleep training that involves crying at 4-months. 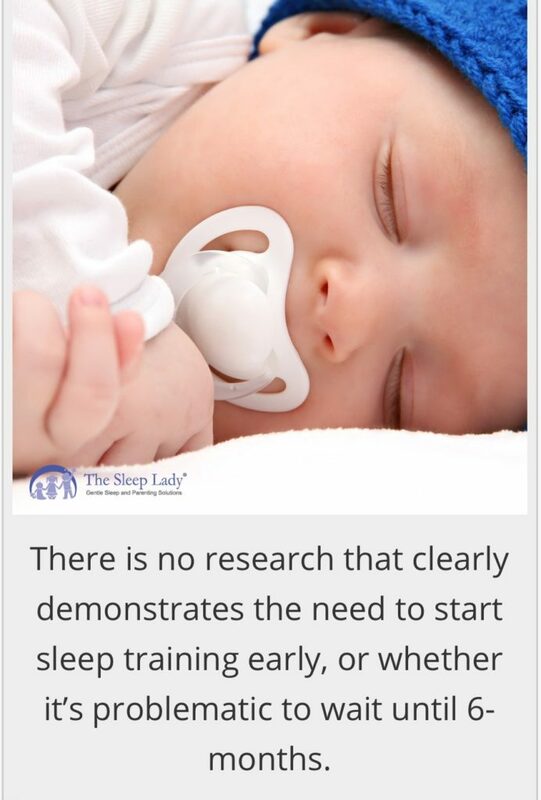 The vast majority of research on infant sleep training has been focused on toddlers and preschoolers . Even staunch cry-it-out researchers do not study infants under 6-months . Existing research on behavioral approaches to improve sleep in younger infants, typically focuses on prevention of sleep problems which may include helping parents understand cues and appropriate sleep hygiene, and only very limited practice slowing down their response to bedtime or nighttime fussing — as little as 1-2 minutes . To date, only one study has used very limited crying with a group of 4-month-olds . In this study, infants still woke during the night at the end of the intervention. It may result in frustration and poorer parental confidence. Jumping to sleep training without looking at development, feeding, temperament, etc. may set parents up for negative experiences. Toughing it out with a lot of crying when the baby may be developmentally unready or has a feeding issue can result in a lot of parental guilt and anxiety . Parents may wonder why the approach isn’t working like the book said it would. It doesn’t help that a lot of advice can make it sound like continued night-waking is parents’ fault. Parents may end up feeling that the intervention isn’t working because they aren’t doing it right. Instead, it may just be too soon to begin. It’s okay to stop and try again after 6-months. There are many gradual ways to work on sleep. It’s important to choose something that’s developmentally appropriate and works with your own values and goals. The parenting road is long. There is no scientific reason to rush to start sleep training. Research suggests there are lots of good reasons to wait until they’re closer to six-months. Focus on getting good daytime feeds. Try to nurse/feed in a quiet, darkened room so that your baby can focus on feeding, and not all the interesting things that he/she can now see so much more clearly because of development in the visual portion of the brain. A check-in with a lactation consultant if your baby is very fussy can be a good idea to help with any underlying feeding issues. Get daytime naps in any way that works. Babies under 6-months can only stay awake about 90-minutes at a time. Good daytime naps will help encourage good nighttime sleep. Holding or feeding to sleep or using motion (swing, carrier, etc.) is okay for now. It won’t be a lasting “bad habit.” You can fade out of all of these ways to get your baby to sleep and transition to a firm surface once your baby has passed through the 4-month sleep regression and is closer to 6-months. Practice “drowsy but awake” at bedtime, but don’t expect results. You can practice putting your baby down to sleep before they’re totally out and see if you can soothe them the rest of the way. If it doesn’t work well, don’t worry about it and just try again another time. Just practicing this skill will help once you start coaching in earnest. If your particular situation requires that you to work on sleep now, go slowly until the regression is over. Try a gradual approach and carefully monitor how much and how intensely your baby cries. There are gradual options for this age. Consider contacting a Gentle Sleep Coach to give you support and help problem-solve your options. Once your baby is older than 6-months and if they’re still waking more than you’d like, you can make changes knowing that your little one is more ready and able to learn to manage their sleep. Ezzo, G., & Bucknam, R. (2012). On becoming babywise. Sisters, OR: Hawksflight/ParentWise. Giordano, S., & Abidin, L., (2006). The baby sleep solution: A proven program to teach your baby to sleep twelve hours a night. New York, NY: TarcherPerigee. Herman, C., & Ryan, K. (2012). The dream sleeper. San Francisco, CA: Jossey-Bass Waldburger, J., & Spivak, J. (2007). The sleepeasy solution. New York, NY: HCI. Douglas, P. (2013). Diagnosing gastro-esophageal reflux disease or lactose intolerance in babies who cry a lot in the first few months overlooks feeding problems. Journal of Pediatrics and Child Health, 49, e252-256. Bourgeois, J. P. (2001). Synaptogenesis in the neocortex of the newborn: The ultimate frontier for individuation. In C. A. Nelson & M. Luciana (Eds. ), Handbook of developmental cognitive neuroscience (pp. 23-34). Cambridge, MA: MIT Press. Trevarthen, C., & Aitken, K. J. (2003). Regulation of brain development and age-related changes in infants’ motives: The developmental function of “regressive” periods. In M. Heimann (Ed.) Regression Periods in Human Infancy (pp. 107-184). Mahwah, NJ: Erlbaum. Kopp, C. B. (1989). Regulation of distress and negative emotions: a developmental view. Developmental Psychology, 25(3), 343-354. France, K. G., & Hudson, S. M. (1990). Behavior management of infant sleep disturbance. Journal of Applied Behavior Analysis, 23(1), 91-98. Gordon, M. D., Hill, S. L., & Forisha, B. (2006, July). “Crying it out:” A critical review of the literature on the use of extinction with infants. Poster presented at the World Infant Mental Health Conference, Paris, France. Gordon, M. D., Hill, S. L., & Forisha, B. (2006, July). “Crying it out:” A critical review of the literature on the use of extinction with infants. Poster presented at the World Infant Mental Health Conference, Paris, France. France, K. G., & Hudson, S. M. (1990). Behavior management of infant sleep disturbance. Journal of Applied Behavior Analysis, 23(1), 91-98. Lawton, C., France, K. G., & Blampied, N. M. (1991). Treatment of infant sleep disturbance by graduated extinction. Child & Family Behavior Therapy, 13(1), 39-56 Owens, J. L., France, K. G., & Wiggs, L. (1999). Behavioural and cognitive-behavioural interventions for sleep disorders in infants and children: A review. Sleep Medicine Reviews, 3(4), 281–302. Hiscock, H., Bayer, J. K., Hampton, A., Ukoumunne, O. C., & Wake, M. (2008). Long-term mother and child mental health effects of a population-based infant sleep intervention: cluster-randomized, controlled trial. Pediatrics, 122(3), e621-e627. e.g. Matthey, S., & Speyer, J. (2008). Changes in unsettled infant sleep and maternal mood following admission to a Parentcraft residential unit. Early Human Development, 84(9), 623-629. St James-Roberts, I. (2008). Infant crying and sleeping: helping parents to prevent and manage problems. Primary Care, 35(3), 547–67, viii. St James-Roberts, I., Sleep, J., Morris, S., Owen, C., & Gillham, P. (2001). Use of a behavioural programme in the first 3 months to prevent infant crying and sleeping problems. Journal of Paediatrics and Child Health, 37(3), 289–297. Adachi, Y., Sato, C., Nishino, N., Ohryoji, F., Hayama, J., & Yamagami, T. (2009). A brief parental education for shaping sleep habits in 4-month-old infants. Clinical Medicine & Research, 7(3), 85-92. Tse L., & Hall, W. (2008). A qualitative study of parents’ perceptions of a behavioural sleep intervention. Child Care Health & Development, 34, 162–72. Macall Gordon has a B.S. in Human Biology from Stanford University and a Master’s degree in Applied Psychology from Antioch University Seattle. Her graduate training included infant observation, attachment, emotional regulation, child development, and family systems. She has also conducted and presented research examining the research underpinning existing infant sleep interventions at child development and infant mental health conferences around the world. Her other research has examined current sleep advice and its impact on parenting experiences with managing their baby’s sleep. 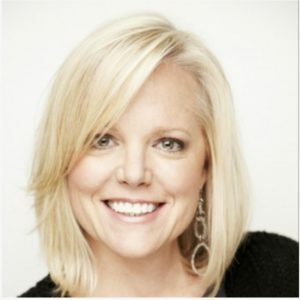 Macall is an Adjunct Faculty at Antioch University, Seattle, teaching research in the graduate program in Applied Psychology, Counseling & Family Therapy. She is also a WA State Certified Counselor (#CL60604117) approved by Washington State to work with parents and families.